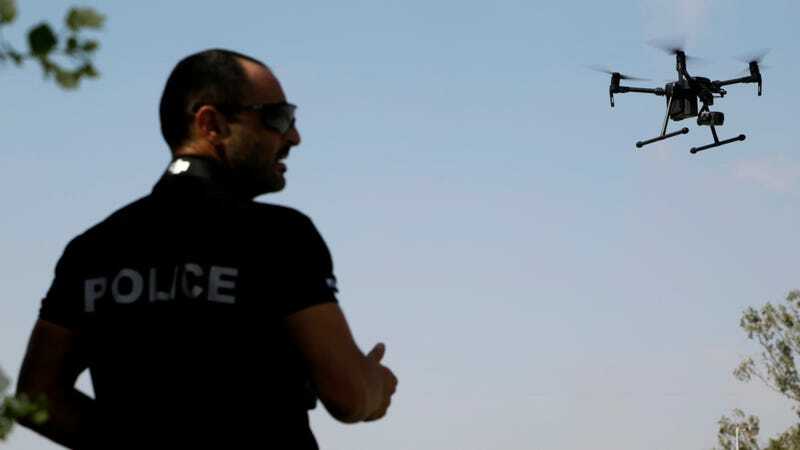 A police officer with the Sovereign Base Areas of Akrotiri and Dhekelia, British territories on the island of Cyprus that house numerous UK military facilities, testing a drone designed to cut down on illegal poaching of migratory birds in 2017. The British Army is carrying out a major, four-week test of 70 new technologies, “including unmanned vehicles and surveillance drones,” as part of its “Autonomous Warrior experiment,” the MIT Technology Review reported this week. As the MIT Technology Review noted, there is considerable concern that the Ministry of Defense aims to deploy autonomous weaponry in the future. The Titan UGV, for example, came up in a recent Task & Purpose article noting the possibility smaller and more mobile unmanned vehicles could replace main battle tanks—which are very costly to operate and sometimes viewed as a cumbersome relic from prior generations of warfare. For example, Task & Purpose noted that one prototype Titan variant “mounts a Javelin anti-tank missile as well as a .50-caliber machine gun,” though its manufacturers emphasize that it still requires human authorization to fire. A promo video from manufacturer Milrem Robotics did showcase numerous other uses for autonomous vehicles, such as platforms for crew-operated weapons systems, towing disabled vehicles, and evacuating wounded personnel. A recent report by Drone Wars UK found that “the technology needed to build autonomous weapon systems is currently under development in a number of nations, including the United Kingdom.” It noted that while in the short term, autonomous military uses of such technology will likely be in “low risk areas, such logistics and the supply chain,” it is also “increasingly likely to become weaponised and the degree of human supervision can be expected to drop.” It also argued that while both the U.S. and UK are the only countries to have detailed policies on autonomous weapons systems, they are limited in nature and allow research on such systems to move forward, and that senior military officials have given conflicting statements on the matter. The Joint Doctrine Publication states that “Fully autonomous weapons systems as we describe them (machines with the ability to understand higher-level intent, being capable of deciding a course of action without depending on human oversight and control) currently do not exist and are unlikely in the near future,” if at all. The Ministry of Defence has been accused of ‘defining away’ the problems associated with autonomous weapons by setting such a high threshold of technical capability to define them. As the Register noted, other concerns from the Drone Wars UK report included a drone swarming project aimed to minimize human supervision, as well as the Taranis drone, which the group described as being able to “self-plot a route” while “searching for targets.” Drone Wars UK noted that Taranis manufacturer BAE Systems said in an interview that though it does not expect the military to change rules requiring human selection of targets, the drone’s developers were working on the assumption that such capabilities could be authorized in the future.